You can love it or hate it, but when it comes to hiring or searching new opportunities, you just can’t ignore LinkedIn. With more than 400 Million users, it’s one of the most indispensable tools to find details about a company and its employees. But many of these users have also wondered at some point – what are some good alternatives to Linkedin? But it’s this huge size that can be troubling at times. With almost everyone in there, it becomes difficult to search the right people or jobs. Here are some reasons why you may also be looking for alternatives to Linkedin. Why look for alternatives to Linkedin? Linkedin is the biggest networking directory of the professional world. Right from freshers to professionals with more than 25+ yrs experience, from Entertainment to Steel industry, from white collar to blue collar jobs – Linkedin has it all. Hence it’s no surprise that there is a huge amount of action on LinkedIn each day. Pesky recruiter emails, irrelevant news feed, half-hearted job applications, all of this make it time-consuming to find the relevant signals. Due to this noise, it becomes difficult to focus on meaningful things. It also makes people disengaged, leading to delay in responses. Linkedin Easy Apply: Linkedin easy apply is a two-click method, which is enabled by recruiters who wish to get quick applications from candidates on Linkedin itself. But most of the recruiters don’t enable this option as it attracts huge noise and it increases the recruiter’s work in terms of tracking applications. Linkedin Apply: If a recruiter doesn’t enable Linkedin easy apply, then a job posting will take you to either their own career portal or some other job boards. In most of the cases, recruiters prefer this option because this makes it easy for them to track and manage applications on a single platform. Exploring new jobs on LinkedIn? Updating your profile, liking someone’s status updates and adding new connections with recruiters is probably being noticed by your boss and colleagues. LinkedIn offers options to hide some of your activity, but as a social network, it leaves several trails. Due to the fear of such conversations or attracting present employers attention, most of the job seekers look for better alternatives to LinkedIn that offers more privacy. 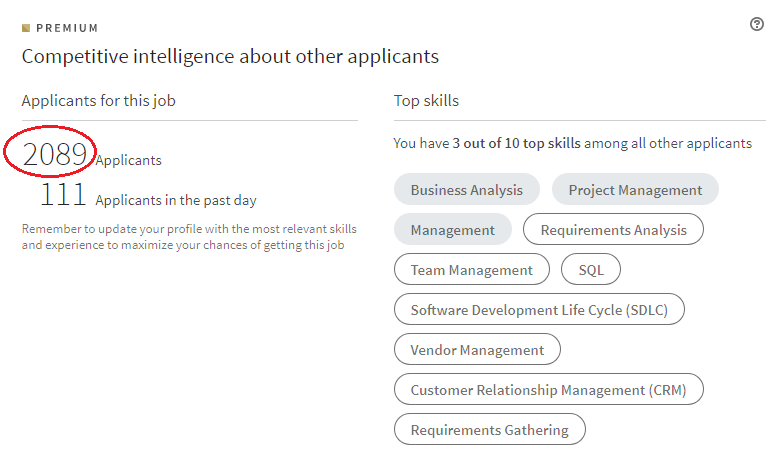 To job seekers, Linkedin offers a paid option “Jobseeker premium” which has some features such as competitive analytics and higher placement in search results. Not sure how many users actually buy this plan after the free trial is over. 1.) 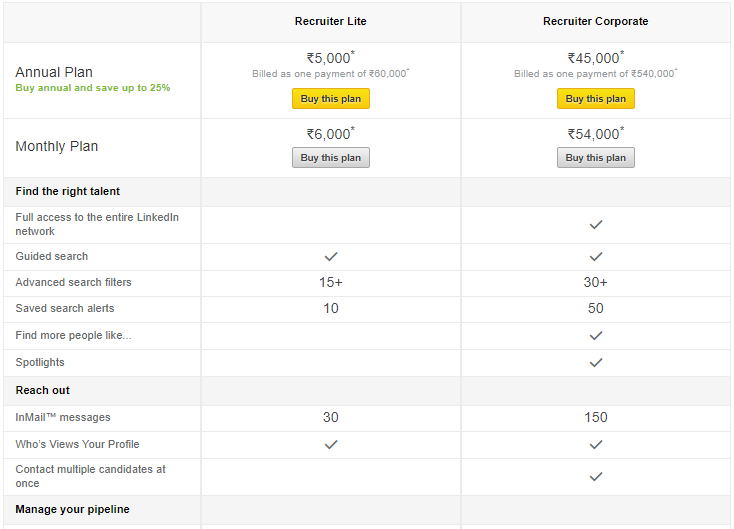 Recruiter lite: In this plan, you get 15+ advanced filters and 30 InMail monthly messages with other standard features like the ability to view who visited your profile etc. A monthly subscription to this plan will cost you Rs 6500 / month & annual subscription of this plan will cost you around Rs 5500 / month. 2.) Recruiter Corporate: This plan is mostly targeted towards staffing agencies. A monthly subscription of this plan will cost you Rs 64000 / month & annual subscription of this plan will cost you around Rs 53000 / month in which you can access 30+ advanced filters and 150 monthly InMail messages. So what are the top alternatives to Linkedin? Specifically focusing on startups, AngelList may have started as a fundraising tool, but has rapidly become a popular recruiting platform. Thanks to its size (1M candidates profiles globally) and completely free offering, it has seen fast adoption by startups and users alike. 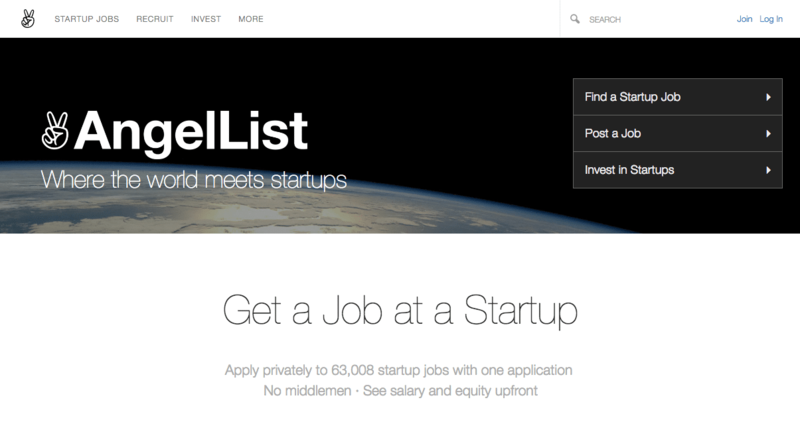 AngelList is a good recruiting resource every startup should try out. It’s easy to use and has a free plan. Its paid pricing plans are a bit expensive though (starting from $199/month). Used by 3000+ companies, from smaller startups to big companies such as Google & Amazon, CutShort focuses on removing noise. It offers higher relevance, better privacy and faster responses than Linkedin. It does so by intelligently using matchmaking algorithms, gamification techniques and Artificial Intelligence (it offers a professional assistant that suggests next actions and helps in scheduling meetings etc.). CutShort is getting popular between startups and bigger companies alike that want to reduce noise from their recruiting. CutShort offers a 100% free plan and paid plans starting at around $50/month. iimjobs is considered as the largest job board for mid to senior management jobs in India. IIMJobs features some of the best jobs in Banking & Finance, Consulting, Research & Analytics, Sales & Marketing, HR, IT and Operations. Although the name might suggest that it’s a platform purely for IIM graduates but these days anybody looking for a job anywhere in India can make a profile on the platform. For your bulk hiring or mainstream IT jobs, job boards such as Naukri might be a good option. The benefit of these platforms is their reach. You can get a lot of leads within a short span of time. The UX is not great and there is huge noise problem as well, but if you have niche requirements, there is no escaping these job boards. For job search, you may want to look up the hiring companies and explore more responsive options such as CutShort to actually apply for jobs. No doubt that Linkedin is the biggest professional networking platform in the world, but as it often happens in recruiting, size is not everything. Linkedin clearly lacks some fundamental requirements of a recruiter or a job seeker like privacy, noise control and better matchmaking.